Sunset is a popular Cox-style apple, which we recommend as one of the best alternatives to Cox's Orange Pippin as it is much easier to grow. The parentage is not known but it is almost certainly a seedling of Cox. Disease resistance is far better, cropping is good and reliable, and it is self-fertile. 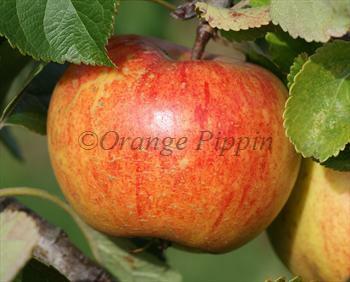 The flavour is balanced and sweet, with many of the aromatic qualities of Cox's Orange Pippin. Sunset also has the attractive orange-flush so characteristic of Cox and other traditional English apples. Please fill in the details below and we will let you know when Sunset apple trees are back in stock. A very similar Cox-style apple. Sunset is in flowering group 3. Sunset is self-fertile and does not need a pollination partner, although fruiting may be improved if there is a compatible tree of a different variety nearby. Since it flowers in the middle of the blossom season it can be pollinated by most other apple trees. The main horticultural problem with Sunset is that the apples tend to be quite small, but this is easily corrected by thinning the fruitlets thoroughly in May and early June. Sunset can be grown reliably throughout much of the UK. It is one of the most disease-resistant of Cox-style varieties. It is a neat and compact tree, and a good variety for growing in a patio container. Introduced in 1918, unknown parentage but assumed to be a seedling of Cox's Orange Pippin.